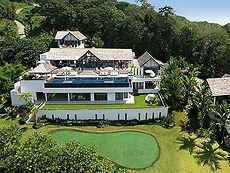 Villa Chan Grajang located on the small hill of Surin Beach area at west coast of Phuket. In the total space of 2,200 sqm have two villas with as many as 6 Bedrooms. The villa can arrange for stay from one bedroom as your choice. Full of green surrounded the villa can see the ocean view with well-kept garden. A luxury rental villa stay at Villa Chan Grajang makes your memorable time in Phuket.